We had a great time in Seville, in particular at the Sierpis Hotel. Especially nice to note the attention and goodwill of the hotel team. For example, Antonio helped us not only with questions of stay, but also with technical problems (establishing communication). They all were very kind. Cleaned up in the room every day: it was clean. I will recommend this hotel to my friends. Great localization and cleanliness! 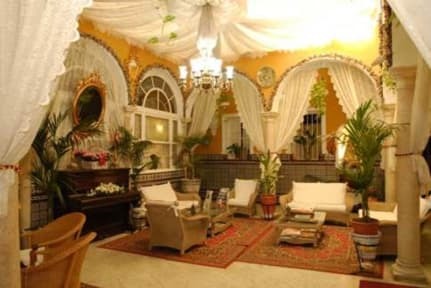 If I visit Sevilla again, probably I will stay in the same hostel! Such a nice place. Working TV was also very handy. Me and a friend shared a room. Only hiccup was there was a small part of the bathroom that leaked but didn’t impair us whatsoever. Staff were extremely friendly and helped with touristy stuff. I would recommend. Cute building and good location in Santa Cruz area. There is no elevator so be mindful if you have a lot of luggage on a higher floor to maybe request a lower floor. The private room was great, with an on suite bathroom. Simple but seemed clean and good enough to rest after a long day of site seeing. The best selling point for this place is location. It’s seriously central to everything. The rooms are clean, if not exactly luxurious. However, the two-level patio is lovely. Staff were helpful. The atmosphere is not like a youth hostel. It’s more like a budget hotel so if you’re looking for a social experience, this is not it. That being said, the rooms were fine, the hostel had everything we needed while we were there, and we were happy with our stay. The hostel was in a nice location, in a narrow street very near the Cathedral and the center of the city. 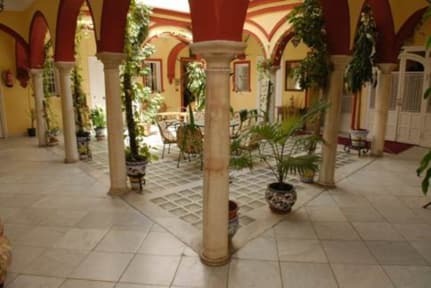 The patio on the ground floor and on the first floor were charming, but my room was quite small and dark. Location is great, but everthing else is really a disaster. Old, uncomformatble beds, very loud, actually like sleeping on a street. Also, they had some kind of construction going on and really didn't care that it is 8am and that we are sleeping.